In Brazil and South Dakota, KL Energy changed its name to Blue Sugars, following extension of its long-term co-development agreement for cellulosic ethanol with Petrobras. Company CEO Peter Gross noted that the company’s scale-up factor from our demo plant to full-sized industrial units is in the range of 10-15, and that Petrobras is already working on its first industrial cellulosic ethanol plant slated for start-up in 2015, after licensing Blue Sugar’s technology for use in its Brazilian sugarcane mills. Gross told Bloomberg, in a report published yesterday, that it expects to produce cellulosic ethanol from bagasse at a cost of 40-50 cents per liter, and will supply technology to three Brazilian mills, by 2015. Local farmers facing high fuel costs will soon be able to enjoy a cheaper source of homegrown fuel: biogas. The government of Antigua and Barbuda has announced it will roll out the first biodigester in Liberta, the third-largest town on the Caribbean island of Antigua this month. The Ministry of Agriculture is embarking on a biogas project which could save farmers thousands of dollars in annual production costs, it estimates. The biogas system will be installed at Titan Farms Limited in the village of Liberta. The system to be installed at Titan Farms and will be an enclosed structure which will allow for the biological breakdown of organic (plant and animal) matter as well as animal manure to produce biogas. The gas derived from the biodigester will then be used for lighting, cooking and for fuel for machinery on the farm such as generators and combustion engines. The Inter-American Institute for Cooperation on Agriculture is assisting the Ministry of Agriculture with funding for the biogas system. “The cost of fuel is one of the biggest problems affecting Livestock farmers. The biggest expense for farmers in Antigua is the cost of fuel,” explains Agriculture Minister, the Hon. Hilson Baptiste, who is of the view that since agriculture is becoming increasingly scientific on Antigua and Barbud , it is up to the farmers to improve their level of production. He hopes that other livestock farmers incorporate the system on their farms as well. Marvin Joseph, a proprietor of Titan Farms says the successful installation of the biogas unit will, “provide immense benefit for local farmers.” He says the unit could save livestock farmers close to $3,000 dollars in electricity bills per annum. The Ministry of Agriculture is now seeking outside assistance in providing additional biogas systems for other livestock farmers across the country. Advanced biofuels from agricultural wastes could replace half of global gasoline consumption by 2030, but more research is needed to specify how much waste can be sustainably used, according to a new report by the WWF. The report warned that lthough crop residues have the advantage of not requiring additional land, residues are still integrated into the agricultural system as a physical and carbon resource. According to the authors, to develop a full picture of the potential of advanced biofuels, a sustainability assessment is needed. This assessment should determine what environmental effects could be induced through the removal of crop residues for biofuel production, and which policy recommendations might follow to ensure sustainable use. The study - Smart Use of Residues - is based on research by environmental research consultancy, Oko-Institut and the German Biomass Research Center (DBFZ) and has been published by WWF with support from Novozymes (US:NVZMF) - a biotech company with a strong focus on enzyme production. Within the global WWF Energy Vision, which calls for 100% renewable energy by 2050, agriculture residues contribute 25 exajoules (EJ) of primary energy (1EJ is equivalent to 278 million MWh), amounting to around 25% of the total primary energy produced from all residues in 2050 (101 EJ). Other waste residues that will contribute to the total include 1 EJ from oil and fat residues, 25 EJ from forestry and wood waste, 11 EJ from dry waste and 38 EJ from wet waste and residues. The report based this number on the assumption that in OECD countries only 35% of the straw is available for energy purposes due to competing use as soil fertiliser, animal feed or animal breeding, and because of collection barriers. In estimating that half of gasoline demand could be met by biofuels from residues, Bloomberg New Energy Finance assumed that only 17.5% of the residues would be taken from the field for biofuels. "The technology is now available to turn agricultural residues into advanced biofuels. This represents an opportunity for Europe to lead in the decarbonisation of the transport sector globally while creating green growth and jobs in Europe," commented Lars Christian Hansen, President Region Europe at Novozymes. "But we need to do it right from the beginning," he cautioned. "This study represents a first step in this direction. Policy makers need to take over and support advanced biofuels while guaranteeing their sustainability." According to the report, to date there has been little research into the potential environmental impacts using residues as a feedstock biofuel feedstock. The report warned that removing too much agricultural residue could have potential consequences on biodiversity because of changed habitat functions such as shelter, fodder source or nesting places. The authors noted that research has estimated that as many as 50% of all species in Europe depend on agricultural habitats. Reducing the input of fresh organic matter in the system (i.e. stubble) will impact not only on the organisms living on the soil surface but also organisms in deeper soil layers, cautioned the report. In addition the study said that the export of agricultural residues from the field means a loss of organic material which influences the humus balance of the soil. A removal of crop residues can lead to a decline of humus over time - impacting soil fertility and other soil functions. Agricultural residues also serve to help the soil retain water, and slows the evaporation process. According to the report the diversion of these residues for biofuel production could potentially lead to soil erosion. Furthermore, the report said that reduced input of agricultural residues could effect the lead to increased carbon emissions, both from a growth in the application of fertilizers and from the impact on soil carbon - carbon held within the soil which forms the largest terrestrial pool of carbon. According to Jason Anderson, head of Climate and Energy at WWF European Policy Office, advanced biofuels produced from agricultural residues have a role to play in cutting our greenhouse gas emissions from the transport sector, and they need strong EU support. "Ambitious EU action on advanced biofuels would also help relieve concerns over indirect land use change effects that increase greenhouse gas emissions and compete for productive land resources or with food production," he said. The report said that to date there is no uniform definition for sustainable extraction rates of agricultural residues to avoid or minimise environmental impacts. on sustainable potentials of agriculture residues in Europe, which showed a range from 20% to 40% of recommended extraction, but noted that this did not take full consideration of the potential impacts highlighted by this review. Ultimately the report concluded that here are some aspects that need further investigation at regional level to draw the line between sustainable and unsustainable amounts of residues being taken from fields to produce advanced biofuels. A Memorandum of Understanding (MoU) for the joint development of 100 MW waste to energy facility in Abu Dhabi has been signed by Abu Dhabi National Energy Company PJSC (TAQA) and The Centre of Waste Management Abu Dhabi (CWM). According to TAQA, having developed the concept over the past twelve months it has agreed to work together with CWM to create one of the largest waste to energy plants in the world, and the first of its kind in The United Arab Emirates. The energy company said that the facility will be capable of processing up to a million tonnes of municipal solid waste per annum, contributing towards CWM's stated target of 80% diversion of waste from landfill, which falls within the Abu Dhabi Vision 2030 objectives. TAQA added that its experience of building, owning and operating thermal power facilities makes the development of a waste to energy plant a natural addition to its fleet. "Keeping up with the Abu Dhabi Vision 2030 requires the concerted efforts of various departments and national institutions to develop in a sustainable and environmentally responsible way," explained HE Mohammed Al Bawardi, chairman of The Centre of Waste Management Abu Dhabi. "In signing this Agreement, we at the Centre of Waste Management see cooperation with TAQA as the mainstay of a sustainable waste management strategy, focusing on our goal of 80% diversion of waste from landfill," he added. Meanwhile, chairman TAQA's Board of Directors, HE Hamad Al Hurr Al Suwaidi said: "A strategic partnership between our two entities to divert waste from landfill and create a long-term source of energy is a major step forward in Abu Dhabi's vision for a cleaner and more sustainable environment, and demonstrates our commitment to energy security through non-traditional means of power generation. "We see this as the first of its kind in Abu Dhabi, with more to follow, utilising waste as a resource and working as a team to provide employment and technological advancement in the region," he continued. Although a relatively minor player within the overall bioenergy sector, the market for biogas sits at the confluence of a number of forces, including increasing demand for distributed generation, tightening environmental regulations, and accelerating build-out of infrastructure for natural gas and for vehicles powered by natural gas. According to a new report from Pike Research, this fast-growing market reached $17.3 billion in global revenue in 2011 and will nearly double by 2022, hitting $33.1 billion in that year. A by-product of anaerobic digestion (AD) – a process in which microorganisms break down organic matter in an oxygen-starved environment – biogas is gaining traction as a versatile energy carrier with significant potential to meet growing demand within the power, heat, fuel, and chemical markets. 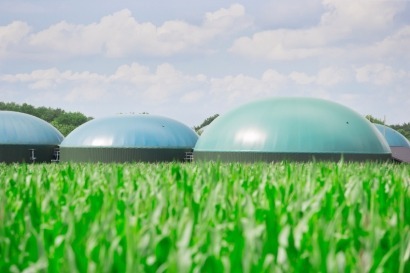 Pike Research reveals that the biogas market will grow from $17.3 billion in global revenue in 2011 to $33.1 billion in 2020. Global installed production capacity is now more than 800 billion cubic feet per year, representing nearly 14.5 gigawatts (GW) of installed distributed and grid-scale renewable generation capacity. With at least 11 billion cubic feet per year of production capacity expected to come online worldwide by the end of 2012, renewable natural gas (RNG) is a growing segment within the diverse biogas landscape. While opportunities abound for high-Btu RNG in gas-to-grid injection and vehicle fuel applications, low fossil natural gas prices are expected to restrict market growth in the absence of strong policy incentives. Pike Research’s report, “Renewable Biogas”, analyses the global market opportunity for biogas capture across four key industrial segments: municipal solid waste (MSW), agriculture, industrial, and sewage treatment. The report provides a comprehensive assessment of the demand drivers, business models, policy factors, and technology issues associated with the rapidly-developing market for biogas production and utilisation. Key industry players are profiled in depth and worldwide revenue and capacity forecasts for raw biogas and RNG production, segmented by region and industrial segment, extend through 2022.